I make the cornbread a day ahead!! Because the cornbread will be more dense and easier to make the stuffing with. FYI - I used 2 boxes of the Jiffy mix. But it all depends on how much you want to make. I highly recommend doing this the day before you plan on serving the stuffing. On the day of, cut the cornbread into 3/4 inch cubes. Finely chop three stalks of celery and one medium sweet onion. In a medium pan, cook 1lb of pork sausage or italian sausage (which is what I used this time) until browned. Once it's cooked, put the sausage into a large mixing bowl. Add the chopped celery and onion into the pan. Also add 1/4 cup of water. Cook for 10 mins. The veggies will soften. Season with salt and pepper. Once cooked, add the veggies to the sausage in the large mixing bowl. Simmer 1 cup of low-sodium chicken broth.. Finely chop fresh sage.. I chopped four leaves. Lightly beat three large eggs..
Add the egg and sage into the large mixing bowl with the cooked veggies and sausage. Then add the cubed cornbread into the mixture. Also add 1/2 cup of the chicken broth (should be moist not wet) and lightly toss and mix. Preheat oven to 350 degrees. Add the cornbread/sausage mixture into a baking dish. You can always make this ahead of time during the day of and then cover/refrigerate until ready to be baked. And it's your choice to add the pre-baked stuffing into the turkey! But I chose to do it on the side. Our table full of delicious dishes - green bean casserole, cole slaw, mac&cheese, roasted veggies, gravy made from the turkey drippings, mashed potatoes, stuffing, and lingonberry sauce including the turkey (post-carved by my dad!). Proud that I was able to get the turkey nice and juicy! Go me! hahaha..
Hope you guys enjoy! And let me know, what are some of your favorite dishes for Thanksgiving? love this post!!! now i learned a new recipe!! omg that looks so goood! xO! this look so yummy! great post! Sheila, you are a cooking machine. Paula Deen will be ashamed ! It looks so delicious. The best part are leftovers, isn't it? My son is already asking me when am I gonna make some ham? Have a great Thanksgiving minus the turkey. Omg yum. I cannot wait for thanksgiving! oooh man you are just quite the little cook aren'tcha? Mm, looks great!! You're going to have an awesome Thanksgiving! ooh I've been looking for a stuffing recipe, this looks amazing! Thanks for sharing, definitely bookmarking this! i LOVE cornbread stuffing! yours looks so good. i was laughing at the conversation you and your mom had. hahahaha i would've reacted the same way. thanks for sharing your recipe! Oh my, everything looks SO yummy! You made me so hungry with these pictures, I'm so looking forward to my Thanksgiving dinner! Thanks for sharing the recipe, I'm definitely trying it! Hey Sheila, For some weird reason, I thought Thanksgiving was last weekend. Haha. 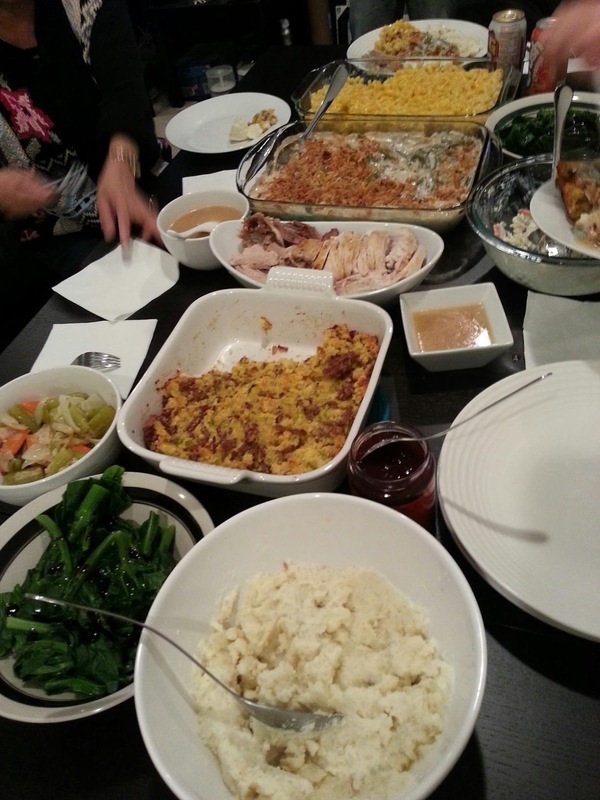 That's why I'm Canadian (never know the exact dates of American holidays) Anyway, your food looks amazing! Yes, I'd be sad too if my mom said that she's not making turkey but we had a really juicy turkey last month. This looks like such a yummy recipe ! I absolutely love your cooking tutorials and this looks so good!! oww yamyyyyy i want all!!! You're making me hungry! Looks yummy! NIce blog you have here :) Started following you by GFC and FB. Cornbread stuffing? That sounds like the food of my dreams. Two of my most favorite things EVER. I do, however, hate cornbread mix. I've tried the Marie Calender one and I had to dump it because it was just so metal-tasting... did not like. Is the Jiffy one good? wow...i would definitely try ur recipe...looks so yumm with all the food in the table :)...and by the way thanks for dropping by in our blog and for the comment...happy weekend ahead!!! Yum Yum Yum! Unfortunately, we don't celebrate thanksgiving in our country.. This looks really good, wish I could cook more elaborated meals like this. I'm a vegetarian though so there's not much for me to experiment with.